Holy cow that looks incredible! So cheesy and rich. I bet it would be great with seitan if I made a few tweaks, to vegetarianize it a bit. Haha, we ALWAYS eat the Mini Chili’s at airports, as we secretly love it too! 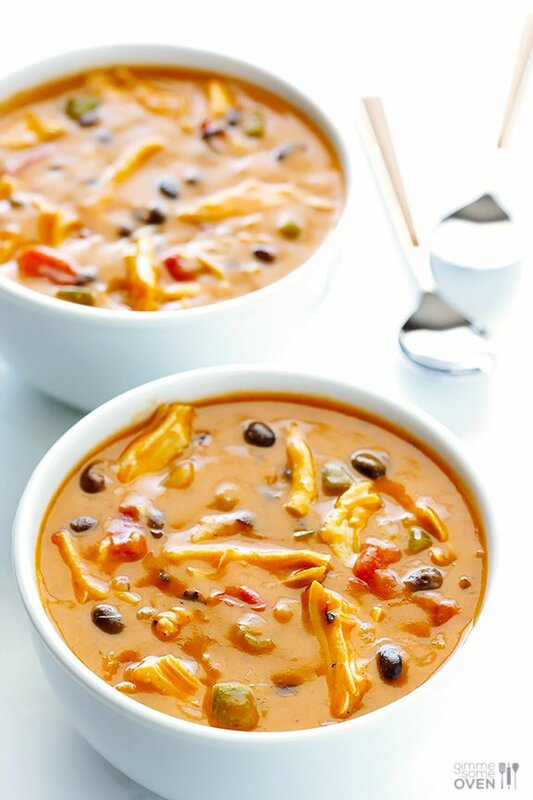 This soup looks ah-may-zing Ali! I can’t wait to dive into it on a cold winter night! Pinned! We ate at chili’s so much growing up. This soup looks amazing! 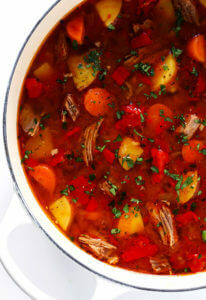 Thanks for providing two recipes both the slow cooker and this version. 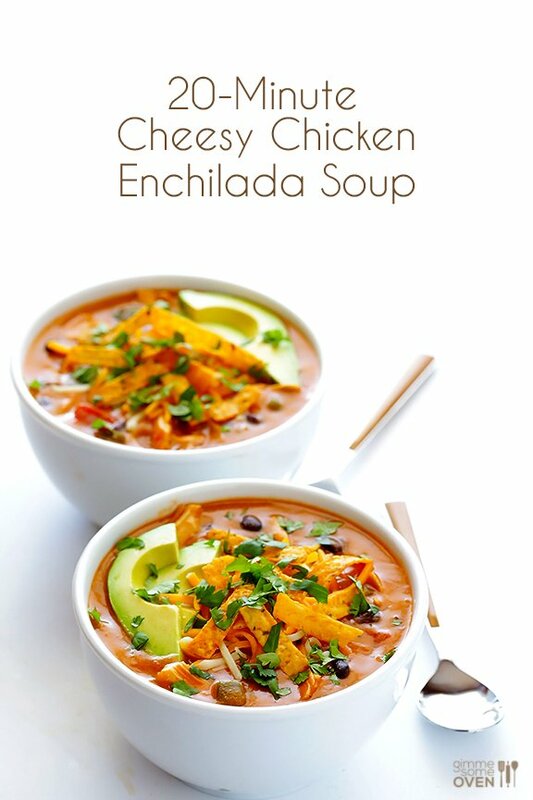 Are you swimming in enchilada soup :)? So funny because Chili’s is one of my favorites! My family thinks it’s hilarious, but it’s easy, they have good food, and good margaritas. I’m so excited to try this soup!! This recipe looks AMAZING. I’ll be making that in the next week pending the weather is out of the 90s here in Savannah. It’s too hot for soup here yet I’m ready for fall as a northern girl! This looks AMAZING! 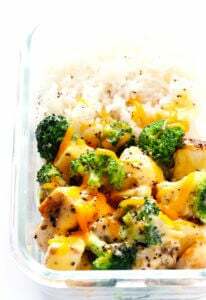 Love how super cheesy this looks, and anything that’s ready in 20 minutes is always a win! This soup looks delicious and I normally hate soup with any kind of meat in it! I live in the UK and definitely can’t get masa harina here easily. Would regular flour or cornflour (cornstarch) work to thicken up the soup? Could you get regular cornmeal? You could use that and grind it a bit finer and that might work. This is now one of my go to recipes! Delicious! I could not find corn flour. but had cornmeal on hand and ground it to a “flour” and it worked great. When it came time to add the enchilada sauce I notice you have “110 oz can”, so I measured out the 1 1/4 cups from a 28 oz can and it was about half so I assume you meant a “14 oz can” but other than that……love it! It may be a 20 min version, but it doesn’t chinz on the right ingredients. Well done! Perfect for most of harried people. 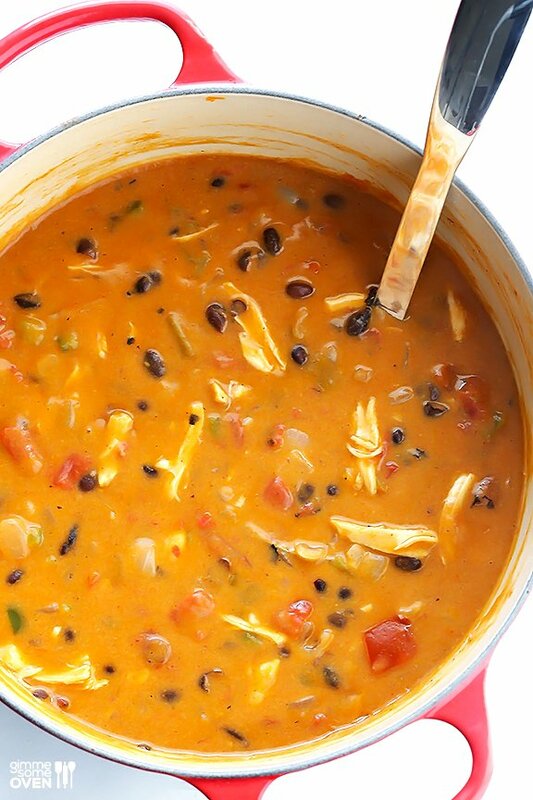 I have to admit, I’m also a fan of the Chili’s chicken enchilada soup, it stems from my college days in Manhattan, KS where there were only so many restaurants to choose from. 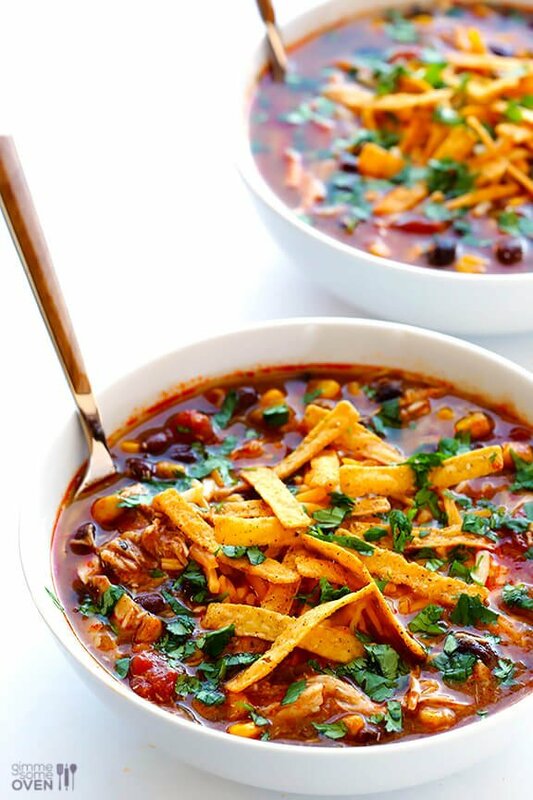 Chicken enchilada soup, chips, salsa and honey lime dressing were weekly indulgences! I’m going to have to try your version! Thank you for doing a non-slow-cooker version of the soup for those of us who do not possess a slow-cooker. I find the idea of masa for thickener intriguing as well as fitting for a Mexican-style dish. Looking forward to trying this – with homemade enchilada sauce. I’ve never been able to bring myself to even consider buying the canned stuff. Isn’t it funny how places you know you “shouldn’t” like keep on being favorites, probably more for the sake of nostalgia (at least that’s what I tell myself to feel better)? I have put your enchilada sauce on my must make list. We make our own salsa verde ’round here, but haven’t ventured to the homemade red-sauce side yet… soon! I need to make this now! Totally my kind of comfort food! 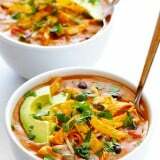 Two enchilada soup recipes to choose from; which one to make first? 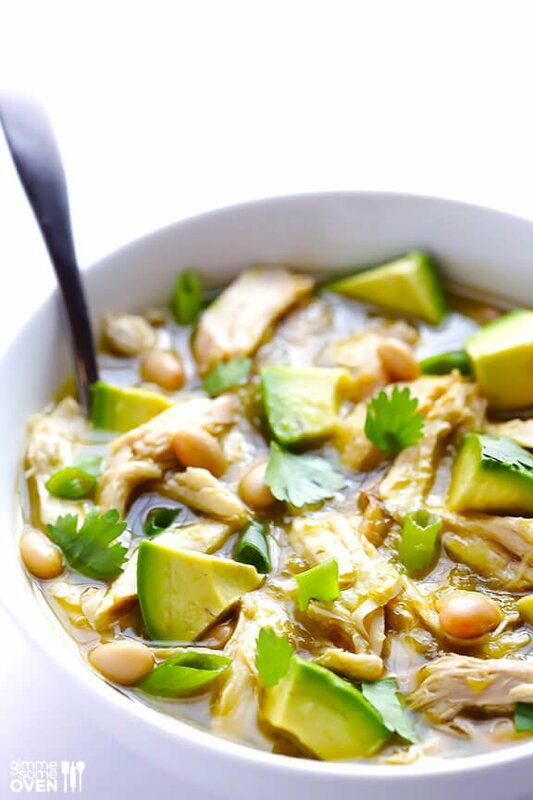 I’ve always loved the flavors in this soup and both recipes look perfect. Thanks for sharing both, Ali! This version looks so good, too! I’m all about the cheese, so the cheesier, the better! I use masa in my chili and my mother in laws recipe for tacos. I love how it thickens with flavor. Yes to cheese and college memories. And more cheese! 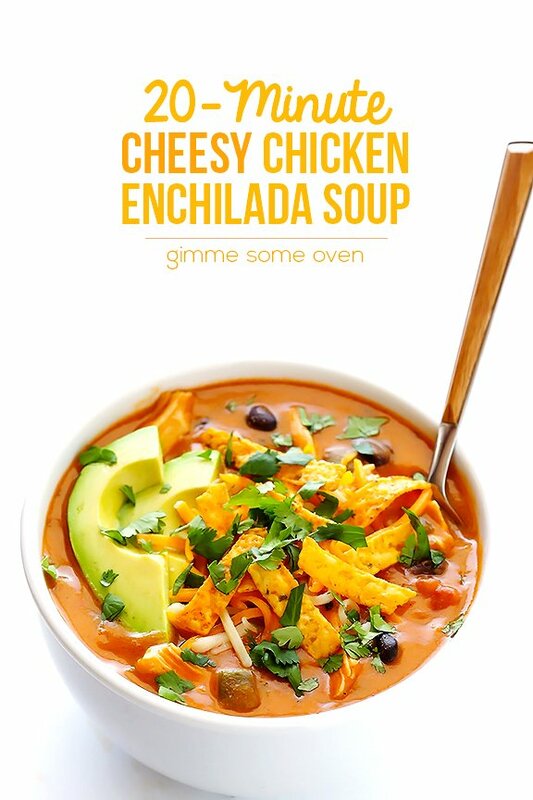 I am definitely craving a bowlful of this enchilada soup right now. 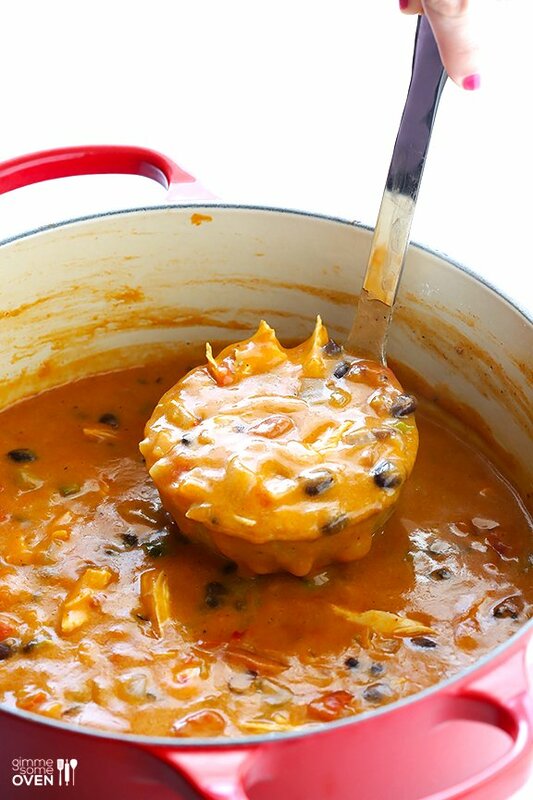 It looks so hearty, delicious and flavoursome.. perfect comfort food for this weather! Great recipe Ali! 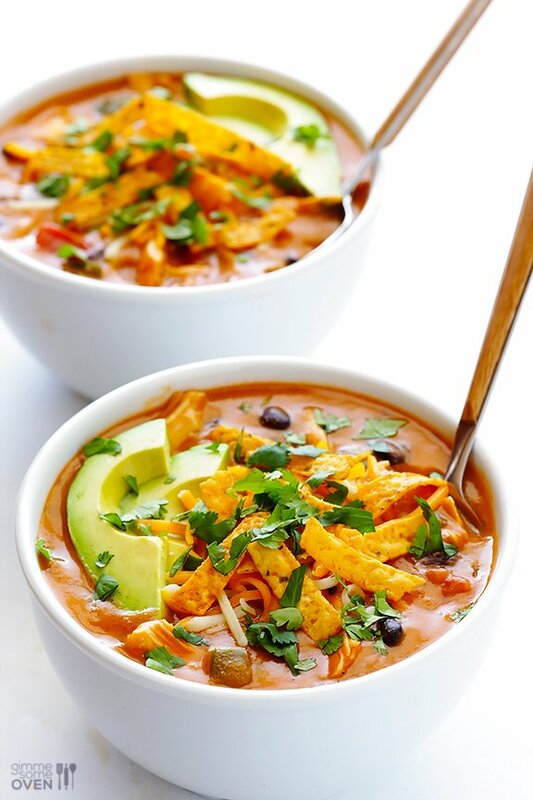 Love how thick and cheesy this enchilada soup is! Pure comfort! Pinned! Masa harina! What a great idea! I’ve been sautéing chopped up corn tortillas in my tortilla soup to get the effect but it always falls a little short on flavor. Can’t wait to to try this! 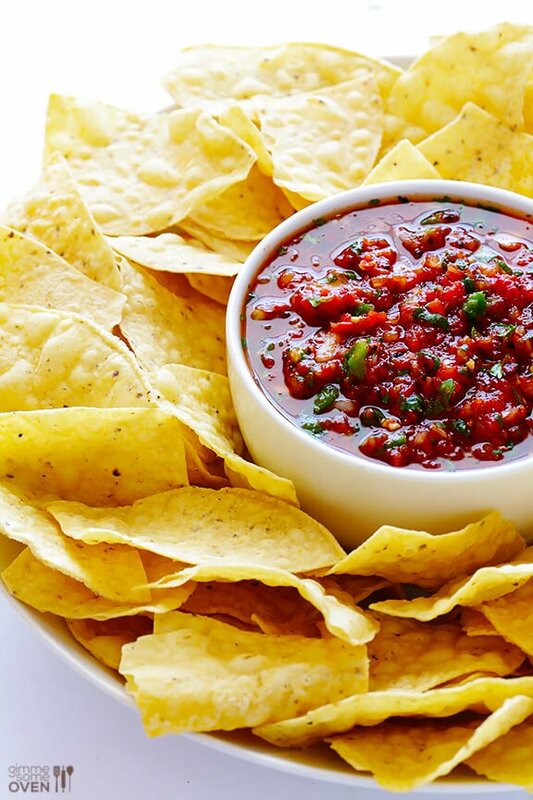 You can crush up tortilla chips to substitute for the masa harina. This was very good. Thick, cheesy and yummy. Thank you for the recipe. Is there any reason why this couldn’t be cooked in a slow cooker?? Waiting to add the cheese right before serving. Want to make the stove top version of this recipe, however, I don’t see a link to do so. Funny thing is, the link was available earlier this week because I wrote down the ingredients I needed to buy. Please help. So sorry, we have had a bunch of technical difficulties today migrating the site to a new design. The recipe is back up now! This looks seriously good! Could you post the measurements you used for the recipe? I would love to make this! just made this. The cheddar did not melt in nicely like your picture looks. It stayed in little granule like chunks and I’m not sure I could really taste it. 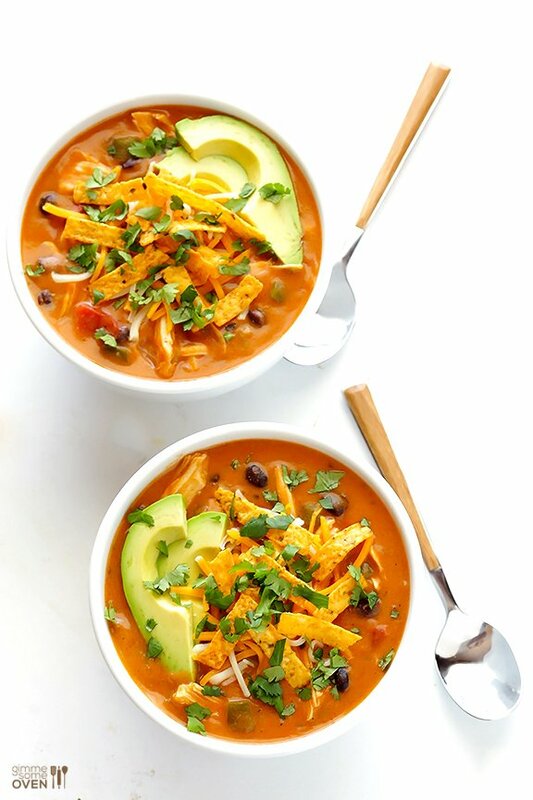 my husband really liked this soup but we both thought it was a lot like the tortilla soup I make and we’ll probably stick with that one. Thanks for giving us something new to try! I accidently bought flour instead of the corn..will it still work? My mom and I made this tonight while she was visiting. . Delicious doesnt begin to describe this soup! Cheesy, a little kick, and the perfect rainy day meal. Will definitely be making this for the hubby soon!!! This is probably my new favorite soup! 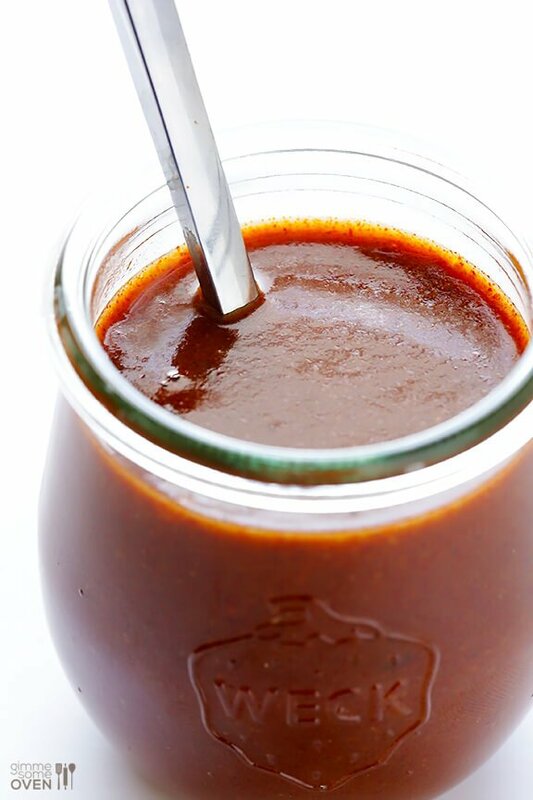 It is super easy to make and the homemade enchilada sauce is really good! Who knew? The mesa is what really makes this recipe sooo good! Holy moly…this could not have come at a better time. We’re having an epic Nor’easter storm on the coast of Maine, so soup is definitely called for. And this soup? Be still my heart! Holy cow just made this tonight and it is SO GOOD. I bought a rotisserie chicken on the way home to shred up so it would be even quicker…..I’m supposed to be writing a paper for school right now but I’m writing here instead haha! Next time I’m definitely going to make your red enchilada sauce, i think that would make this recipe even better, but even with the canned sauce it’s still awesome. 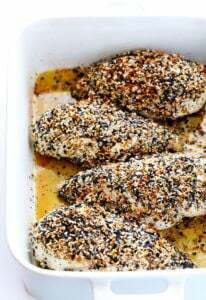 Thank you for a quick delicious recipe, great for my busy week nights! Made this last night with a couple changes and it was SO amazingly good! This is, with a doubt, going on my regular menu list. Posting my own version tonight on my site! Whipped this up tonight, was super easy and turned out delicious! I did use chicken broth instead of stock and siftted regular flour instead of the masa harina and soup is a perfect consistency, I also added Mexican squash that I purchased at Sprouts.